For the second interview we have our next big artist, coming all the way from Basel, Switzerland; STU. Electronic music producer and DJ, STU was born and raised in the hometown of LSD, Basel, Switzerland. 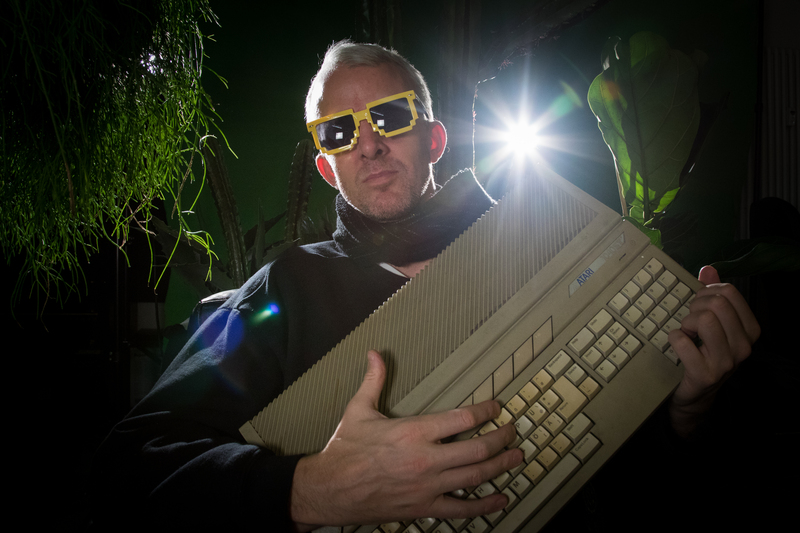 Coloured by the sounds of vintage gear and home computers, his work is a highly energetic blend of various musical styles created within the hardware limitations of the Atari ST and its internal beep maker. STU focuses on the production of his handmade crunchy original sounds embedded into dancey arrangements, rather than perpetuating the stereotype of a Super Mario soundtrack. My name is Stu and I am from Basel, Switzerland. Chiptune, using an Atari ST computer with Musicmon Tracker / STj. A friend of mine was involved into the organisation of a micromusic party in my hometown Basel back in 2001. We were performing live there together with Teamtendo, Rolemodel, Bodenstaendig 2000, FirestARTer and Psilodumputer. Bodenstaendig 2000 did a sort of presentation and live perfomance at the same time. They showed a tracker (running on an Atari ST) by projecting it on the wall. To me that was it, I was definitely ready to become a fulltime nerd back then. We started by sampling C64 stuff, but I was bored with it. I wanted the controls and the overview of the original sound, so I quickly got into tracking. To me chiptune has never been only about the sound aesthetics. I liked the idea of using primitive or let’s say limited technology for something else than it was meant for. That’s especially the case on the Atari ST, which has a MIDI interface on board, but only a quite cheap sound chip implemented. It means abusing it in a way, I wanted to make the chip ‘scream’ (don’t worry, I’m quite a nice guy in real life), so Chiprape has been one of my first ‘hits’ 😉 It still is in the ‘hall of fame’ on micromuisc.net today. In my music, I focused on using heavy beats and more complex sounds rather than being very musical and getting squeeky solos done as it is the traditional style. So Musicmon by Dark Angel became my main tool, and the YM2149 sound chip of the Atari ST my main voice. This tracker has no command lines, using it is a bit weird, it’s really all about the sounds and samples and placing them. I’ve used other softwares and plattforms that I liked, also non-tracker programmes like Nanoloop and DAW’s like Ableton Live and of course a lot of hardware synthesizers due to my job. No matter what I use, I always try to implement a bit of emotion into my music and then roll it, shuffle it with a nice beat and crispy sounds. I recently became a dad and due to limited time I started making music on my phone, which allows me to use very short time slots in all kinds of places, I like that a lot. There are too many to name. Some that come to my mind right now are the Fortezza da Basso, an ancient building in Florence which was used during Festival della Creativita’ or an abandoned shooting range in Petrosawodsk / Russia with an insane sound system inside or a railway wagon in Stuttgart. More recenlty, I played at Macao in Milan, which used to be an auction house for dead animals. Getting gig requests from oversea and exotic places like Russia and Japan. A few, I’m not going to mention all. Recently I’ve been listening to C-Jeff’s latest release as well as 505, Bit Shifter, Boaconstructor, Monodeer, Tri Angles, Kodek, Gesceap, 2A0X and a few more in the chiptune world. Get an overall idea of the different plattforms, their soundchips and softwares before diving into it. Never give up, you need to be a bit of a nerd I guess. I’m not a big game freak, but I’ve listened to a lot of chiptunes, especially Chambers Of Shaolin by Mad Max (Jochen Hippel). 8:35pm, June 15th, Atma, 11 Stevenson Square, Manchester M1 1DB.